Pre-Natal to Third (3rd) Grade Approach to Early Learning – Because children’s proficiency at third grade is a critical marker for their future success in school and as adults, Pennsylvania strives to build a continuum of services and supports from pre-natal to third grade. Child Care and Development Block Grant State Plan – The Child Care and Development Block Grant is one of the primary federal funding sources for monitoring regulated child care programs, child care subsidy through Child Care Works, and child care quality improvement through Keystone STARS. 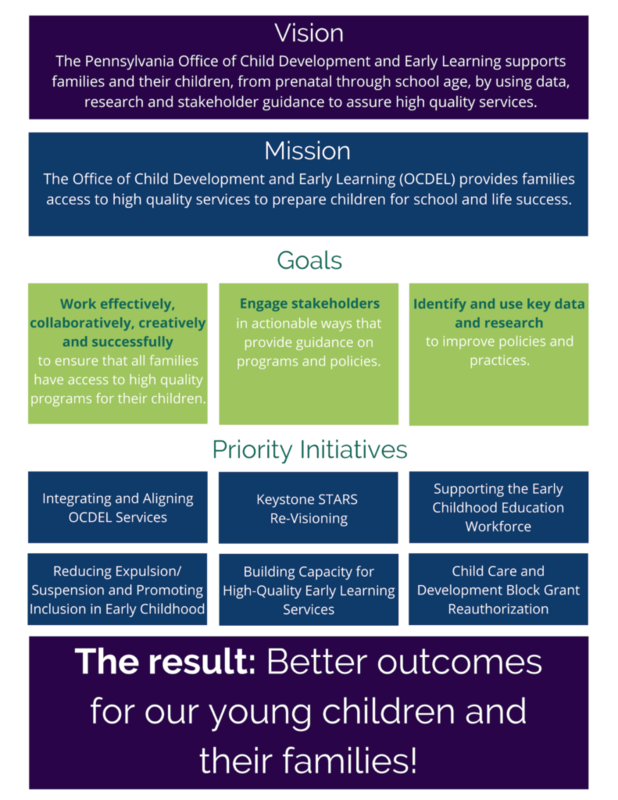 Integrating and Aligning OCDEL’s Services – Aligning standards, monitoring, and quality improvement supports across OCDEL programs so providers can more easily participate and families can more easily access those services. Promoting Inclusion and Reducing Expulsion/Suspension in Early Childhood – When children with disabilities spend time with typically developing children, everybody benefits. Early Learning Standards – All OCDEL programs align their curriculum and child observation to Pennsylvania’s Learning Standards for Early Childhood from birth through Second Grade. Program Quality Assessment – OCDEL programs use a variety of tools to assess the quality of their services for children and families, including the Environment Rating Scales. Race to the Top – Pennsylvania’s $51 million, four-year grant includes multiple initiatives to reduce the achievement gap by third grade.